A New York Times Square billboard BLASTS Socialistm dimwit Alexandria Ocasio-Cortez! 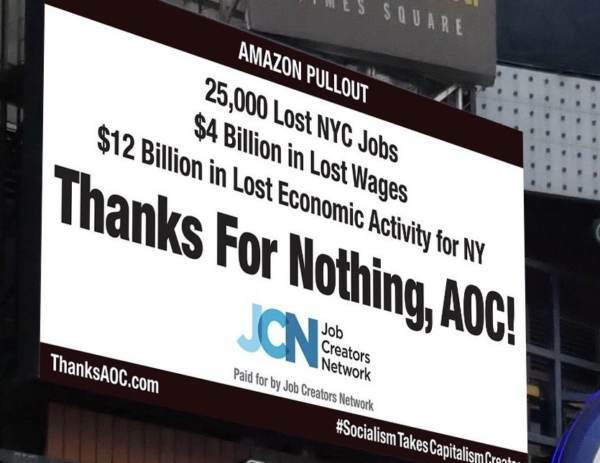 The Times Square billboard was posted by Job Creators Network — a capitalist group. Amazon announced last Thursday that they are cancelling plans to build a headquarters in New York City. Socialist Rep. Ocasio Cortez cheered the loss of 25,000 high paying jobs in her community. Amazon spokesperson Jodi Seth later blamed Socialist darling Ocasio-Cortez for the company’s decision to leave. Via Laura Ingraham and The Daily Caller.